Portal for ArcGIS: If you want to use private Portal for ArcGIS content in your sites, you must configure sign-in using Portal for ArcGIS. You do not need to configure the Portal for ArcGIS sign-in method to use public Portal for ArcGIS content in your sites. ArcGIS Online: If you want to add private ArcGIS Online web maps and services to your sites, you must configure sign-in using ArcGIS Online. You do not need to configure the ArcGIS Online sign-in method to use public ArcGIS Online content in your sites. You cannot mix private Portal for ArcGIS content and private ArcGIS Online content within one instance of Essentials. You can always use public Portal for ArcGIS and ArcGIS Online content in your sites, no matter which sign-in method you choose—Portal for ArcGIS, ArcGIS Online, or Windows. Portal for ArcGIS: If you want end users to be able to sign in using their Portal for ArcGIS account when they launch a viewer, you must configure the Portal for ArcGIS sign-in method. ArcGIS Online: If you want end users to be able to sign in using their ArcGIS Online account when they launch a viewer, you must configure the ArcGIS Online sign-in method. Configuring one of the ArcGIS sign-in methods creates an ArcGIS security provider that you can use to configure permissions in Manager. For information about securing sites, see Security. Essentials always has a Windows Integrated security provider that enables you to secure your sites using Windows Authentication. You do not have to configure the Windows sign-in method in the Post Installer to get a Windows Integrated security provider. When Essentials is registered with ArcGIS Online, your Essentials installation has a built-in service connection for your private ArcGIS Online content. The built-in connection enables you to search your private ArcGIS Online content. The only way to use private ArcGIS Online content in Essentials sites is to register Essentials with ArcGIS Online when you configure the method to sign in to Essentials. For information about service connections, see Service Connections. The built-in ArcGIS Online service connection does not appear in the list of service connections in Essentials, and you cannot add an ArcGIS Online service connection when Essentials is registered with ArcGIS Online, because your Essentials instance has a built-in connection. For Portal for ArcGIS, you must register Essentials with Portal for ArcGIS to access your private content. This creates a built-in service connection that you cannot see in Manager, so you do not need to add a service connection. If Essentials is not registered with Portal for ArcGIS, you can add a service connection to a portal to access public content. Single sign-on signs you in automatically, so you do not need to enter your user name and password. Single sign-on to Manager requires the Windows sign-in method. The ArcGIS sign-in methods do not support single sign-on. When you launch Manager, in order to be signed in automatically, you must already be signed in to Windows. In addition, your browser's security settings must have automatic authentication enabled under the current user name and password, for the appropriate zone. If one or more of these conditions are not met, you will have to enter your user name and password to sign in. Choose the Windows sign-in method. Follow the instructions in Manager Sign-In Using Windows. Follow the instructions in Configure Windows Features. Use your private Portal for ArcGIS content, in your Essentials sites. Secure your Essentials sites using Portal for ArcGIS to authenticate end users. Administrative accounts for your Portal for ArcGIS organization. You can change the Portal for ArcGIS account types that are allowed to sign in to Essentials. For instructions, see Account Types that can Sign in to Manager. When you configure the ArcGIS Web Adapter, which is used with Portal for ArcGIS, ensure that Anonymous Authentication is enabled so that the Essentials login process is successful for Essentials Manager and for the HTML5 Viewers added to a site. Configure the Portal for ArcGIS URL for the administrator's browser to point to when Essentials launches. Add an application in Portal for ArcGIS. Sign in to Portal for ArcGIS when the Post Installer prompts you to. The Portal for ArcGIS application that you add is used by the Post Installer to create two web mapping applications, called Geocortex Essentials and Geocortex Essentials Manager. Essentials and Manager use these web mapping applications to access your private Portal for ArcGIS content. 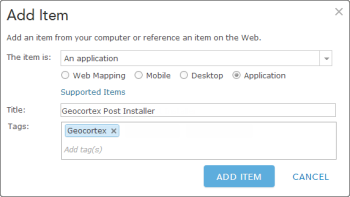 When you complete the post-installation configuration, you can sign in to Portal for ArcGIS and see these web mapping applications in the Geocortex Products folder on your My Content page. Configuring the Portal for ArcGIS sign-in method creates an ArcGIS security provider in Manager. This enables you to secure sites by applying permissions to Portal for ArcGIS users and roles. When users launch a viewer, they can be authenticated by Portal for ArcGIS. For more information, see The ArcGIS Security Provider. The only way to add a security provider that authenticates users using Portal for ArcGIS is to configure the Portal for ArcGIS sign-in method in the Post Installer. The App Registration dialog box opens. If the Remember Me checkbox is selected when you sign in, you will not have to re-enter the App ID and App Secret each time you run the Post Installer. You have now completed the configuration of Portal for ArcGIS sign-in. Use your private ArcGIS Online content, such as web maps and services, in your Essentials sites. Secure your Essentials sites using ArcGIS Online to authenticate end users. Administrative accounts for your ArcGIS Online organization. You can change the ArcGIS Online account types that are allowed to sign in to Essentials. For instructions, see Account Types that can Sign in to Manager. Configure the ArcGIS Online URL for the administrator's browser to point to when Essentials launches. Sign in to ArcGIS Online when the Post Installer prompts you to. URL for Your Organization in ArcGIS Online: For example, https://organization.maps.arcgis.com/. If you specify the URL of your organization's ArcGIS Online portal, launching Manager opens the ArcGIS Online enterprise sign-in page. Only ArcGIS Online users from your organization can sign in. URL for ArcGIS Online: https://www.arcgis.com/. If you specify the URL for ArcGIS Online's home page, launching Manager opens the main ArcGIS Online sign-in page. You can configure which users can access your site from your ArcGIS Online account, including unknown users who have an ArcGIS Online account. You can apply permissions for particular users and organizations from the Permissions page in Manager. 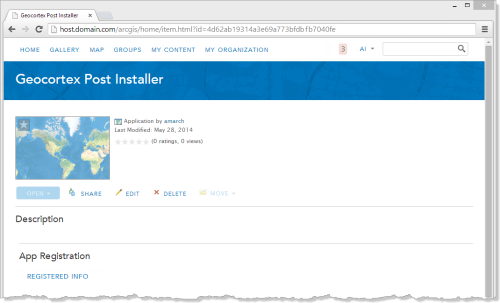 The Post Installer adds two web mapping applications to your ArcGIS Online portal. The web mapping applications are called Geocortex Essentials and Geocortex Essentials Manager. Essentials and Manager use these web mapping applications to access your private ArcGIS Online content. When you complete the post-installation configuration, you can sign in to ArcGIS Online and see these web mapping applications in the Geocortex Products folder on your My Content page. Configuring the ArcGIS Online sign-in method creates an ArcGIS security provider in Manager. This enables you to secure sites by applying permissions to ArcGIS Online users and roles. When users launch a viewer, they can be authenticated by ArcGIS Online. For more information, see The ArcGIS Security Provider. Before Essentials version 4.2, you could add ArcGIS Online security providers in Manager. Starting in version 4.2, the only way to add a security provider that authenticates users using ArcGIS Online is to configure the ArcGIS Online sign-in method in the Post Installer. If you configured an ArcGIS Online security provider before Essentials version 4.2, the security provider and its associated permissions will continue to work when you upgrade to Essentials 4.2 or newer, as long as you configure the ArcGIS Online sign-in method. You can have at most one ArcGIS security provider. If you configured an ArcGIS Online security providers before Essentials version 4.2, and you configure one of the other sign-in methods (Portal for ArcGIS or Windows) when you upgrade to Essentials 4.2 or newer, you will lose your ArcGIS Online security provider and all of its associated permissions. You have now completed the configuration of ArcGIS Online sign-in. Enables you to sign in to Manager using an account that belongs to the Windows group that you configure in the Post Installer. Enables single sign-on to Manager when Windows Authentication is turned on. For information on turning on Windows Authentication, see Configure Windows Features. In the Group box, type the name of the Windows group that users must belong to in order to sign in to Essentials. You have now completed the configuration of Windows sign-in.